The Pennsylvania SBDC network has released its 2015 results showing impacts on Pennsylvania's economy and small business development. “Demand for SBDC services remains strong, and we are committed to having our services available to all small business owners and aspiring entrepreneurs across the Commonwealth” said Pennsylvania SBDC State Director Christian Conroy. 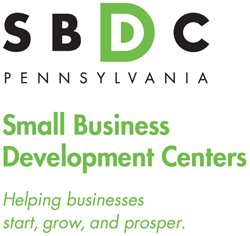 To kick-off National Small Business Week, the Pennsylvania Small Business Development Centers (SBDC) have released the results of their services in 2015. In 2015 the Pennsylvania SBDC network helped small businesses obtain $186,925,064 in new investment for their companies and grow sales by more than $500,000,000 ($429,968,467 in domestic sales and $106,105,297 in international sales). Overall in 2015, 676 businesses were started or purchased with SBDC assistance. The number of aspiring entrepreneurs and small business owners who received no-fee, expert, confidential business management advice totaled 8,592 individuals, resulting in 94,869 hours of business consulting delivered by 18 SBDCs statewide. The number of educational programs held by the Pennsylvania SBDC network in 2015 totaled 683, attracting 10,881 attendees. “Demand for SBDC services remains strong, and we are committed to having our services available to all small business owners and aspiring entrepreneurs across the Commonwealth” said Pennsylvania SBDC State Director Christian Conroy. “Despite flat state funding over the past five years, our network of seasoned business consultants continues to deliver impactful results that have real benefits for communities throughout the 67 counties of the state,” he concluded. Independent analysis of the national network of Small Business Development Centers in 2013 (the most recent year studied), found that SBDC clients’ growth added $18.6 million in federal income taxes and $16.8 million more in state income and sales taxes in that year alone, far exceeding the combined $7.3 million in federal and state funds invested in the program. Economic impact data is verified and validated through a multi-step process which includes verification by the SBDC-assisted business and through an established Pennsylvania SBDC review process and data verification policy. CONSULTING TOPICS: Business plan development was the most requested SBDC service in 2015, followed by marketing, sales and customer relations, ranking third was start-up assistance. BUSINESS SIZE: 57 percent of small businesses who worked with the Pennsylvania SBDC had between one and five employees in 2015 and 33 percent had six to fifty employees. CLIENT INDUSTRIES: In 2015, 55 percent of small firms who were assisted by the Pennsylvania SBDC were operating in the service industry. The second largest group served was manufacturers at 15 percent. Retail companies made up 15 percent, followed by companies in the ‘other’ category at seven percent, construction at four percent, and lastly wholesalers represented four percent of SBDC clients in 2015. To view the full Pennsylvania SBDC 2015 services summary infographic, visit http://pasbdc.org/results/services-summary. To read more about the Pennsylvania SBDC’s data integrity process, visit http://pasbdc.org/about-us/about-the-sbdc/data-integrity. To view a full lineup of business education events occurring across Pennsylvania during National Small Business Week, visit http://www.newpa.com/pasmallbiz. The Pennsylvania SBDC network is the only statewide, nationally accredited program that provides high quality one-on-one consulting, training and information resources to empower new and existing businesses. SBDC consultants work with entrepreneurs in confidential, individualized sessions to help them with a range of business issues including testing a new business proposition, shaping a business plan, investigating funding opportunities, and much more. The SBDC program is a public/private partnership with the U.S. Small Business Administration, the Pennsylvania Department of Community and Economic Development and 18 universities and colleges across the Commonwealth. For more information on the Pennsylvania SBDC services and impact, please visit http://www.pasbdc.org.